Today was my first offical day with the kids on my own. I decided to venture out to the park to meet up with some friends, thinking to myself "I can do this, I can do this..."
And after an hour, it seemed I was going to survive, sitting on a blanket next to my friend, nursing our daughters while our older kids played in the playground sandbox under the direct supervision of two of our other friends. I commented to her that the morning was going pretty well so far for us and even though Baby Addie seemed a bit annoyed by being outside, Dylan was having a good time with his friends. 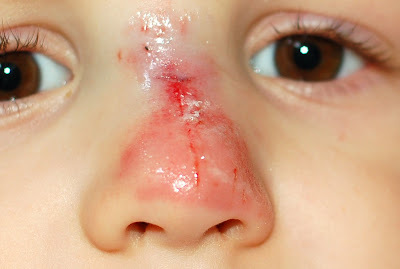 Dylan had been jumping off the little platforms in the sandbox with his buddy Nolan and somehow hit his nose on the platform. My heart leaped from my chest and I ran to scoop him into my arms. The blood running down his nose and his screams broke my heart and those post-partum hormones kicked in and I found myself crying along with him... asking my friends to call Ryan to come meet us at the hospital (where I had just delivered Addie two weeks ago) as soon as he could. After taking xrays and being examined by the ER doctor, the biggest cut at the bridge of his nose was durabonded (glued) together and thankfully there wasn't any break. We all came home and spent the rest of the afternoon piled up in our bed, watching tv and trying to ensure the rest of our day was uneventful. Let's just say that icing a toddlers painfully bruised nose per doctor's instructions took some skill. Tomorrow I don't think I'll venture out far from home. Maybe we'll get the mail. oh goodness!! Poor Dylan! Poor mommy, too! Yikes. What drama, and especially for your first solo day. Hang in there, it's gotta get better than that! I have to say that Briana handled the whole thing wonderfully. When Dylan started to cry she ran to him while still nursing Addie. She handed Addie to our friend Christy, scooped up Dylan and hugged him tight. After a few moments of shared tears, she then went into super mom mode & got him cleaned up & pretty calm. It was totally scary to see Dylan crying with blood on his face, but Briana was awesome. It was a pretty sucky first outing though! Oh my goodness! I echo Julie's comment. It will get better...but I'm with you, start with checking the mail.